This is a marked difference in the COLA over the past couple years. Members, receiving Social Security, saw a meager 0.3% (three-tenths percent) COLA this year and zero raise in benefits for 2016. In fact, it is the largest increase since 2011 when benefits were upped by 3.6%. Well unfortunately many members may see no or very little increase. That’s because there has been more news – in this case, bad – from the feds that will directly impact their SS COLA amount. “This relatively positive news of a COLA for SS recipients must be tempered by reports that the Medicare Part B premiums are also going up in 2018. As announced by the federal CMS (Centers for Medicare and Medicaid Services), the 2018 Part B premium will increase from the current standard $104.90 to $134 monthly– a $29.10 hike or 27.7% increase! Why such a whooping premium jump for many members? Remember the Part B premium is calculated each year. For this year (2017) and last year (2016), retirees, who had the Part B premium deducted from their SS check, got a break on a Part B increase and paid nothing more or very little because they received no COLA in 2016 and only three-tenths of a percent (0.3%) in 2017. They’ve been “protected” under what is called the “Hold-Harmless” provision in the Social Security Law. Basically the Hold-Harmless provision caps any increase in the Part B premium to the amount of the COLA increase for those whose Part B premium is automatically deducted from their SS checks. When they received no COLA in their 2016 SS checks, then their Part B premium stayed exactly the same. While the Hold-Harmless protects many Medicare enrollees, it doesn’t in all cases. That includes: “direct pays” who are billed directly and pay personally for their Part B coverage, new enrollees who first join Medicare in a year when a Part B increase takes effect and higher income enrollees whose 2016 modified adjusted gross income exceeds $85,000 for an individual and $170,000 for a couple. As a result, these enrollees have seen their Part B premiums increase substantially in 2016 and 2017. 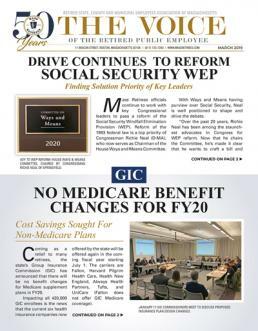 “This is particularly so for our members, mostly widows whose SS spousal benefits were almost wiped out by the GPO (Government Pension Offset) Law and who must pay directly for Medicare at $134 each month,” according to Association President Frank Valeri. “Over the past couple years the Part B increases have been financially devastating for them. It must be emphasized that the Hold-Harmless provision may still provide some level of protection, albeit relatively minor. For example, if your COLA increase is at the average of $27, then your Part B will go up by $27 to $131.90 and no higher. While not charged anything more, you do lose your entire COLA increase. According to federal officials, the average Part B premium for these Medicare enrollees, who are still protected by the Hold-Harmless provision, will be $130 monthly, slightly less than the reported standard premium of $134. Below we’ve included a chart that shows what the Part B premium will be for different groups of Medicare enrollees.